Community Service – Scouts Honor Dr. Martin Luther King Jr.
Troop 353 scouts participated once again in honoring Dr. Martin Luther King Jr. by performing the opening flag ceremony. The event is organized by the Eastchester Community Action Program (ECAP) and is always well attended by the community, corporate sponsors and public dignitaries. A wonderful breakfast, inspirational speeches, patriotic songs and wonderful performances by children of local schools always makes this a memorable event. For photos of this event, click here ! Author scoutmasterPosted on January 27, 2010 February 27, 2011 Categories Activities, Community Service, Events, PhotosLeave a comment on Community Service – Scouts Honor Dr. Martin Luther King Jr.
Each year during the year-end holidays, Troop 353 attempts to gather its available Eagle scouts. These fine young men are often home from college and enjoy the reunion of old friends, notwithstanding any conflicting work schedules. As well, it is a terrific venue for introducing younger scouts to older scouts and to learn why it is important to strive for the rank of Eagle Scout. This year, the hike was to the scenic Storm King Mountain and its sweeping panoramic views of the Hudson Valley and Catskills. 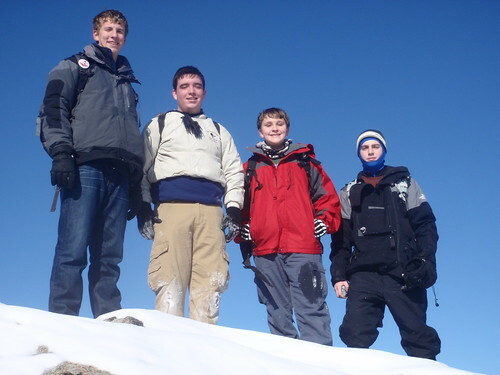 It was a crisp, bright day in January, but the exercise certainly re-emphasized the importance of layered clothing! There are actually two adjacent mountain peaks that our troop hiked and the vertical rise is a manageable 500 feet (or less) and we probably hiked only 2.0–2.5 miles in total. From the top of Butter Hill, only 45 minutes from the parking lot, one can view the Shawangunk Ridge to the west (and several major Catskill wilderness areas), Mount Misery to the South, West Point and Cold Spring to the Southeast and the easterly ledges of Storm King. Then a short walk north to northeast over to the Storm King mountain along the upper Yellow trail, gives hikers unparalleled views of the Hudson River to the north and the east. Directly across the Hudson River to the east is the equally scenic Breakneck Ridge trail, towering above Cold Spring, NY, which the troop hiked in April 2007.